You are here: Home / BlackBerry / Verizon BlackBerry Curve 8330 In Black? That ad have photoshop written all over it. i have the same exact phone same color lol its not a fake trust me!!! If all is true, it’s a seller! Just got my BB replacement this am and the timing couldn’t be any better. Black looks nice, silver was OK in my book too. I’d go with either color. It’s the device and it’s service that’s getting me excited. No Picture here but Sprint does have a getting started guide for the 8330 on its website. go to sprint.com and search 8330 or go to this link. this picture is photoshopped….. verizons curve will be silver. as is all there other new blackberry products. that same silver we see on the 8830 and 8130. i cant see them getting a black curve. sprint i can see getting a black or navy blue curve. but not verizon. my opinion. or fact. just look at the history of verizon. and since when has sprint whose loosing money employees and locations like brush fire get this first?? that blows my mind. Sorry guys that is a fake. They used the Sprint images. I used Robb’s story on my site with this image, dug a little, and found it is a fake. First, let me say that I do not believe this ad is a real one. The marketing line is just too corny, for one thing. However, let me also add this: just because something is photoshopped does not mean it is not a real ad. Remember, the professional ad agencies photoshop the real ads all the time. And the source of this ad was indeed a professional graphics company. So again, I still believe this to be false, but the fact that it is photoshopped is not necessarily some proof of its falsehood. Well I don’t know if any of that matters! All I want to know is when Verizon is getting this phone, the icing on the cake would be the phone in all black! Bluehorshoe: good question. If you look back at the original comment that Robb linked to, as well as the original source for this story, the source link is to an image on the website of a company called Ensomniac Studios. It actually looks like a pretty cool company; Ensomniac does work in visual effects, motion pictures, even symphonic scoring. I rather suspect one of the employees there has a thing about BB’s…probably has been reading about these rumors, and decided to have some fun. Ah, I didn’t look at the link. Thanks. On one of the BB forums is a scan of Verizon’s new rebate form. It includes the 8330 ($50). LOL….looks like hellno decide to use my handle and link it. Cute. hellno WORKS for VERIZON!!! He is a UNION MEMBER. Yes. That’s why he brought up that crazy crap about unions. If you have the time, drop him an email and say hello… NHRASPEED1@YAHOO.COM. In retail on May 12. I was in two corporate stores today. #22 is correct. Online ordering on 9th of May. In stores on the 12th. The units were in the back. The manager showed me an e-mail on his BB from the district manager noting that the units could not be sold until the 12th. Circuit City has no idea when the 8330 is coming out. The 8330 is available online today. I just ordered mine. It may come May 9th or 10th. Store confirmed they won’t be selling it until the 12th. 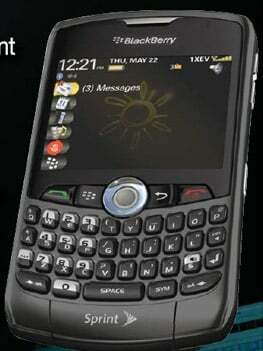 so the verizon phone is not making the blackberry curve 8330 in all black? Sad to say that it is fake. I just upgraded to the 8330 a few weeks ago, and I only had two color options to pick from: Silver or pink. But still the best phone I’ve ever had. guys this is a very nice phone!! mines is all black y cant you all get it in back?